Hoverboards - Do You Remember? Ever since I was little I remember television programmes enticing us with visions of the future and Tomorrow’s World was a fine example. A look back through their archive shows their predictions for what life would be like at the end of the 20th century; some were on the money (touch screens, cordless phones, CCTV, cash machines etc.) but some were wildly off the mark (clothes made out of paper, human secretaries replaced by robots, and a little machine that warmed up squash balls). But the one invention, predicted in 1989, that millions of film fans have continued to patiently wait for was the hoverboard. If Marty McFly (Michael J. 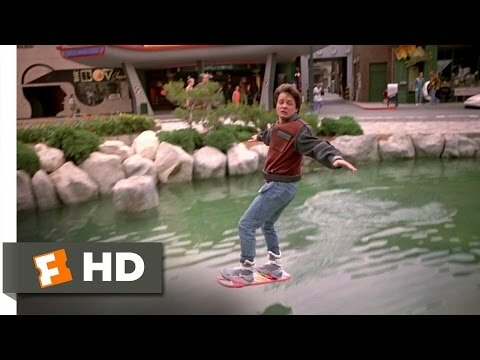 Fox) zooming about on one in Back to the Future II wasn’t enough to make you desperately long to be able to whizz round your town on this floating skateboard without wheels then you were obviously a Luddite that didn’t deserve one anyway. Not that you could have one of course, as obviously they weren’t really in existence back then but the hope of several nations was increased on the film’s release when director Robert Zemeckis (Who Framed Roger Rabbit, Forrest Gump) appeared to confirm that the hoverboard used by Fox was, in fact, real. He’d apparently got bored with constantly answering questions in press interviews about what was clearly a special effect in the film; Fox once told of the time when Zemeckis gave this reply: "What do you mean, how did we do it? It's a real hover-board. It flies. Michael just practiced a lot." He then went on to fib that the reason hoverboards were not on general sale was because parent groups had felt they were too dangerous for their children and as so had pressurised Mattel not to release them to the public. His statement was widely believed at the time and this story has now passed into movie folklore. For those of you who outwardly didn’t believe Mr Zemeckis but were secretly hoping that he was telling the truth then it’s time you were rewarded. In 2014 a U.S. company called Arx Pax released the news that they had managed to bring a hoverboard to life. The Hendo Hoverboard uses…well, it works by….er…um…Look, I’ll just let them tell you, shall I? ‘The magic behind the hoverboard lies in its disc-shaped hover engines. These engines induce an opposing magnetic field in the surface substrate below that provides lift, levitating our board off the ground.’ Yes, that. And even though the Hendo Hoverboard is in its early stages (you won’t be whizzing down to the shops on it at the moment, more spinning up and down an inch over a conductive metal floor) it is still cool. Hey, I’ve seen the promotional video of skateboarder Tony Hawk riding one so it must be. After a successful crowdfunding attempt, the team at Arx Pax are due to release a handful to the general public in 2015 and they are also developing the technology behind it for far more practical purposes. They reckon it can be used, on a bigger scale, to stabilise buildings caught in earthquakes, for example. One of the founders of Hendo, Greg Henderson, says ‘The hoverboard is the first step to bringing this technology to the world.’ Time.com voted the Hendo Hoverboard one of the 25 Best Inventions of 2014. So, do you fancy owning one? Got $10,000? Marvellous! If that’s a bit out of your price range then Mattel (the hoverboard featured in Back to the Future II was made by toy company Mattel) brought out a replica (albeit a non-working replica obviously) of the movie one in 2012. Fans rejoiced at this news and then immediately stopped rejoicing when they looked on Amazon and saw that they’d have to pay £649 for the privilege of standing on a lifeless piece of wooden board on their front drive. To be fair Mattel make it clear that it is a limited edition collector’s piece rather than a toy but even still. And it devalued further because the real die-hard BttF aficionados immediately noticed that the accuracy of the reproduction could definitely have been better. So unless you have a lot of dosh to spend then it looks like your chances of flying on a real hoverboard (or even standing on a pretend real one) are a bit limited for the moment. A quick search on the internet shows that theoretically you could make your own if you have the time and the energy. And four leaf blowers and a water ski. Much cheaper of course than forking out ten thousand dollars (and you won’t need a special floor to ride it on) but you would of course have to sacrifice the coolness of the Hendo Hoverboard for how you’d look wobbling around on a water ski and four leaf blowers. So, in summary then: hoverboards – for most of us at least – are still a daydream for the time being. But if Marty McFly’s ascending antics got you hankering for a world where not touching the floor whilst travelling is a must but you can’t afford 10K or don’t have access to enough garden tools then there is another way. Not only do hoverboards – or floating boards with similar names – appear in a variety of cartoons (The Jetsons, Thundercats and Ben 10) books and other films (Masters of the Universe, Highlander II to name two) but they are also featured in a multitude of video games (Disney Infinity’s The Incredibles) so at least you can sort of pretend you’re on one. Playing a game where you get to ride a hoverboard around a virtual environment is obviously not the same as wowing everybody you meet by having a real one but it is certainly a lot cheaper.